vvvv – where do you go ? When you google „vvvv“, you will get about 18 million results. But still it is surprising how little vvvv is known across creative technologists. vvvv is a toolkit mainly used for interactive installations — and in fact a real success story made in Germany. Born in 1998 by MESO, the software celebrates its 20th birthday this year and was the interactive platform for numerous colourful installations worldwide. Here at SPACE, our team made use of vvvv for several installations: For FIFA, we developed the large interactive projection wall with help of vvvv. 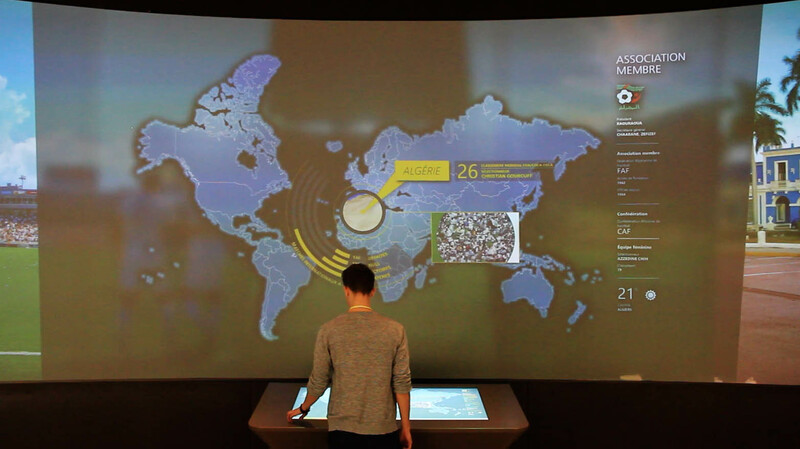 In Berlin and Strassbourg, we created a special EU projection mapping table running in sync with 5 client touchscreens. 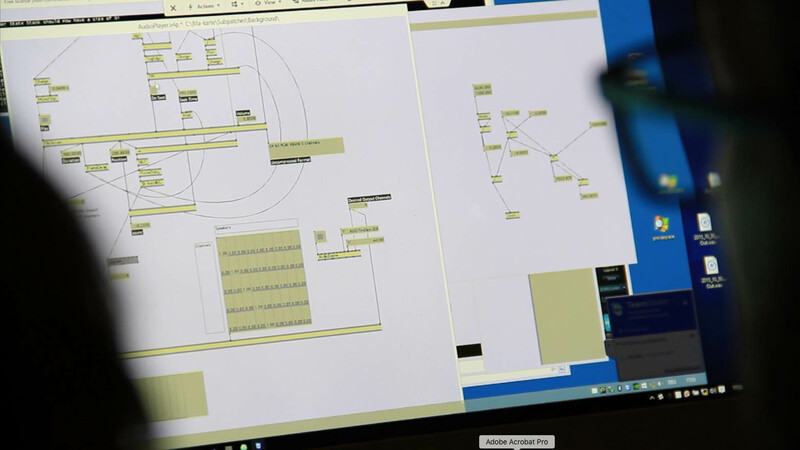 During these productions, we appreciated the fast way we could develop visual results with vvvv: It is considered a „visual programming“ solution: Instead of writing code and compiling it every time for a release, users „patch“ the logic as a network of functions and connection lines. No wonder that most vvvv users are „hybrid artists“ between design and coding — either designers that learned to patch vvvv, or software developers that have a strong visual talent. Speed is the real asset of vvvv: Our production pipeline was significantly faster in vvvv than with traditional development process as we had a direct preview what we were creating. We call it „live coding“: We tweaked parameters inside the vvvv patch/network and immediately saw the result. No more compiling coffee break. vvvv runs on DirectX11, allows shaders in HLS and c#. It provides all kinds of interfaces to media hardware. The range of interface nodes has grown over the years, from light controllers, over cameras, 3D sensors, laser projectors, VR sets or GPS kits. It sometimes feels like a swiss army knife for a digital playground. One of its charming aspects: vvvv is run by the core team „vvvv group“ that actively develops the toolkit and often react directly on user feedback on the vvvv website. You see it already on the website: vvvv is not handled as a super-glossy software product, but rather as a community-driven toolkit. Perhaps this is also the reason why vvvv remains popular and known only in Germany: There is no strong marketing behind it, as the similar US tool TouchDesigner has. With 20 years on its birthday cake, vvvv is a grown-up tool — but we clearly see the strong trend torwards UNITY. So where do you go from here, vvvv? With 20 years on its birthday cake, vvvv is a grown-up tool. During the last years, there were not many huge new features introduced. New users still find vvvv’s user interface confusing. And the limitation to run only on PC might have been the biggest down-side in the world of creative coders often running Mac. Some improvements such as the new VL (.NET visual language) or the vvvv.js extension did not really bring the big step-ahead. As a result, we now see a strong trend to develop installations in UNITY. We also do this, and UNITY is great and has a vast community, too. However, we keep vvvv in our heart: Especially its ability to easily run multi-PC / multi-projector setups (in vvvv language called boy-grouping) is remarkable and cannot be compared to UNITY yet. Our SPACE crew is looking froward to built many more large-scale projections with vvvv also in future!